A float board rode on the forward deck of a kayak, ready for use when the hunter struck a seal with his harpoon. The board was then thrown overboard to drag behind the wounded animal. 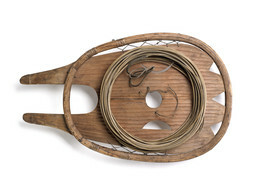 A leather line connected the float board to the harpoon point and lay coiled on top of the device when not in use. Cut-out shapes in the wood represent the full, half, and crescent stages of the moon.